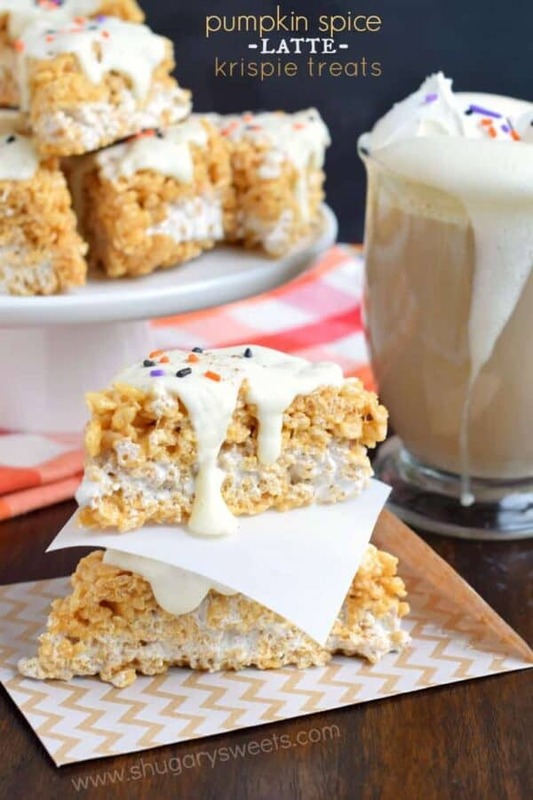 Chewy Pumpkin Spice Latte Krispie Treats with all the delicious fall flavors. And a pinch of espresso for good measure! If you know me then you are probably looking at this post and saying..OMG yes, this is Aimee’s favorite dessert. It combines my love of Pumpkin Spice Lattes with my love for Rice Krispie Treats. I mean seriously, there is nothing better in this world to treat yourself to than this. 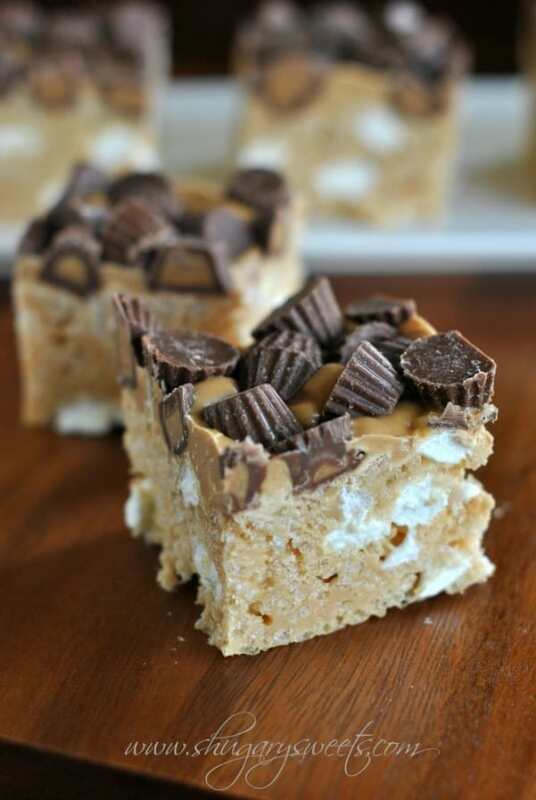 I have even perfected the dessert by creating the ultimate, Perfect Rice Krispie Treats. 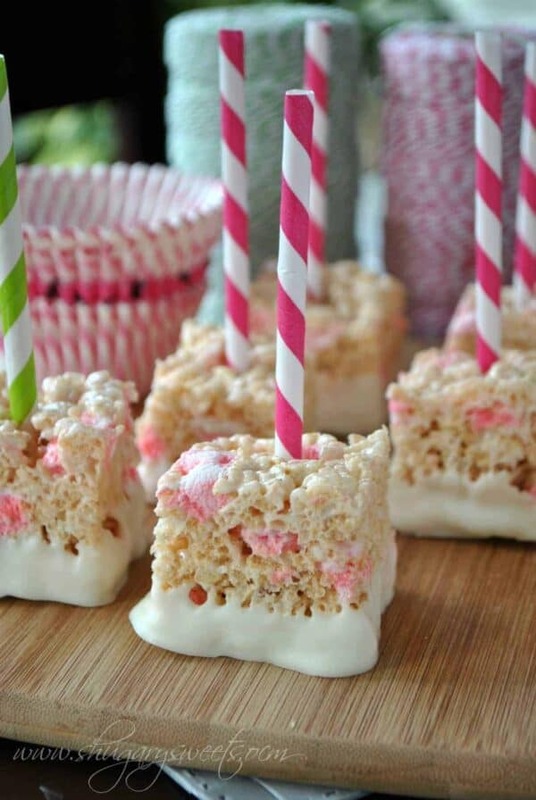 You’ll find the recipe loaded with tips and tricks on how to make rice krispie treats! !). So, for you friends who still want to make Pumpkin RKT, this recipe is for you today. Unfortunately, I had to make these a couple times to get the texture JUST RIGHT. If you add too much pumpkin they become “soggy.” The end result of today’s recipe is chewy. However, these are best eaten within 24 hours (48 max). They do become softer after that time (although I didn’t mind the texture because the flavor was still amazing, my kids didn’t care for it after 24 hours). to mimic a pumpkin spice latte and give it a little pizzazz. The creamy marshmallow filling is so fantastic, you’re going to wish there was more. As you can see from the photos, these are super easy to put together. First though, to help prevent them from being soggy, you’re going to cook down your pumpkin puree with butter for several minutes until the excess liquid has burned off. Then proceed by adding in your marshmallows and stirring until they are smooth. 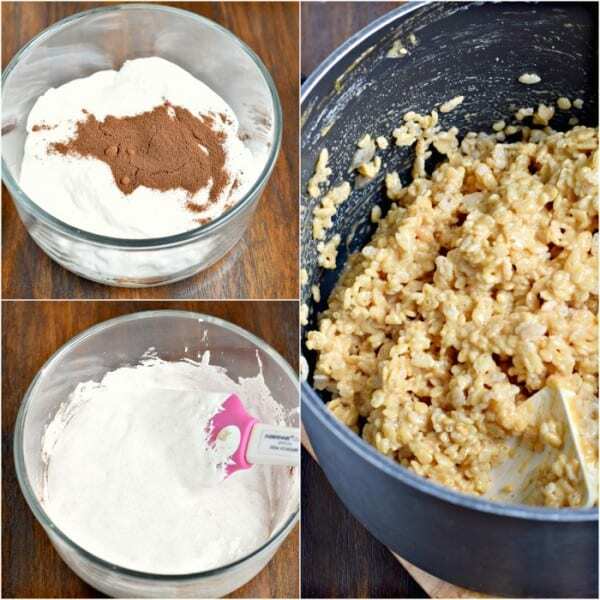 You’ll want to add the cereal quickly and press half of the mixture into a parchment paper lined baking dish. 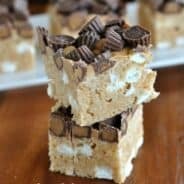 In a small bowl, you’ll combine the ingredients for the marshmallow filling and then spread that over your first layer of krispies, followed by your remaining cereal mixture. NOTE: do not press these firmly into the pan. I use my fingers (which I butter lightly) to press my krispies GENTLY. The firmer you press, the dryer and harder they become. Trust me. I’m a krispie treat expert. I wear a badge. When they have finished setting up (about two hours) remove them from the pan by lifting the parchment paper. Cut into desired sized treats. Add your melted white chocolate, a pinch of nutmeg and some sprinkles. I wanted them to have the appearance of a pumpkin spice latte (nice, right???). 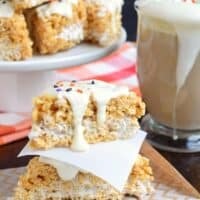 These Fluffernutter Krispie Treats are one of the most popular versions on my blog. Make them once and you’ll understand the obsession! 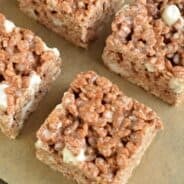 Peppermint Krispie Treats: perfect for the holidays! 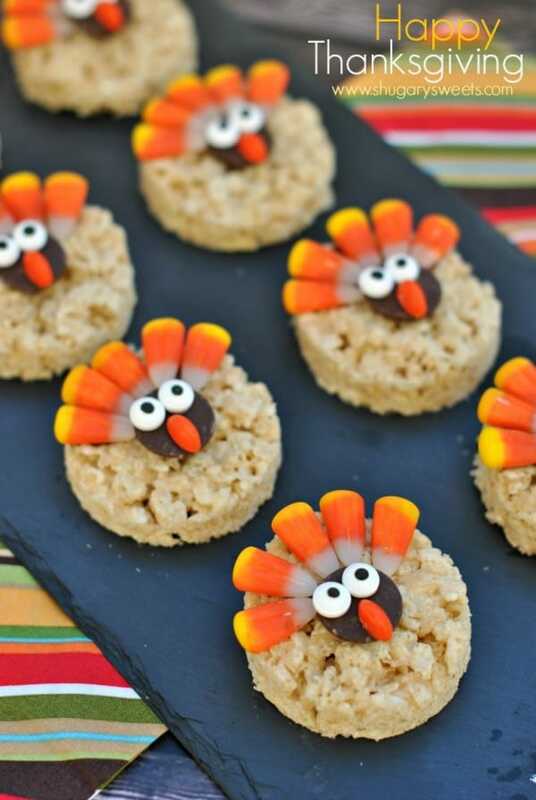 Turkey Krispie treats: almost too cute to eat. Would look great on your Thanksgiving table! In a small bowl combine marshmallow cream with espresso powder. Set aside. In a large saucepan, add butter and pumpkin. Heat over medium high heat and bring mixture to a boil, while stirring constantly. Continue boiling for about 2 minutes, allowing all the excess liquid from the pumpkin to cook off. Add pumpkin pie spice and marshmallow to saucepan. Reduce heat to low, and stir until smooth and all the marshmallows are melted. Remove from heat. Fold in the Rice Krispies cereal. Pour half the cereal mixture into the bottom of the prepared baking dish. Press gently into baking dish using a small piece of parchment paper. Spread marshmallow cream mixture over first layer of cereal using an offset spatula. Top with the remaining cereal mixture, pressing gently with an extra piece of parchment paper. Cover with plastic wrap and allow treats to set up firmly, about 2 hours. 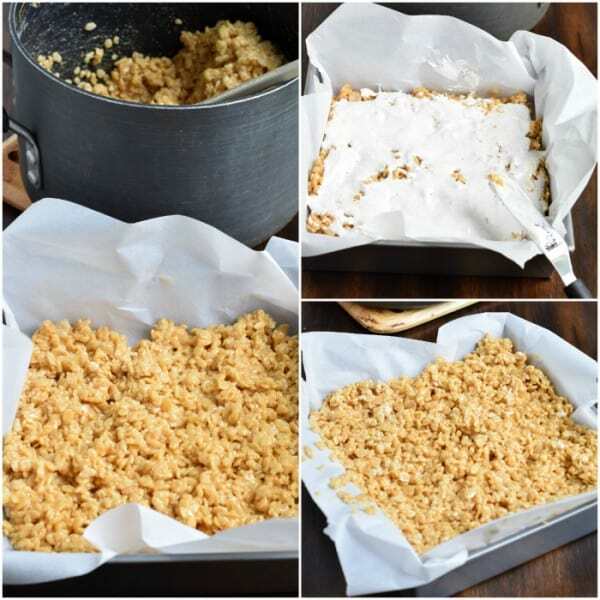 Once firm, remove treats from pan by lifting with the parchment paper. Place on a cutting board and make three vertical and three horizontal cuts. You will have 9 large squares. Cut each square in half from corner to corner, creating 18 triangles. Separate slightly on cutting board. Spread melted white chocolate over the top of each treat. Add sprinkles and/or a pinch of pumpkin pie spice to each treat. Store in airtight container at room temperature for up to 3 days. ENJOY. 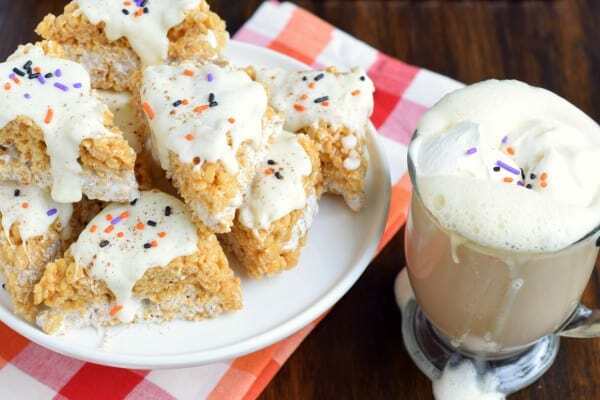 Today’s recipe for Pumpkin Spice Latte Rice Krispie Treats was originally published on September 21, 2015 on Shugary Sweets and has been republished in September 2018. This a PSL treat I woulf face-plant right now! Gah, marshmallows + pumpkin? YES PLEASE! These sound so good! Two of my favorite things wrapped up into an amazing treat! 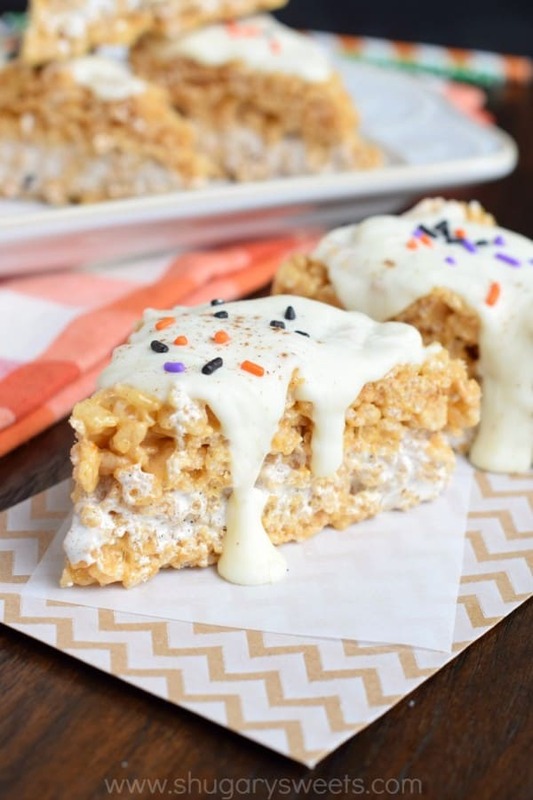 Wow, who would have thought to put pumpkin spice in a Rice Krispie bar? Not me but it sounds interesting. You know those desserts that you just make for yourself?! This recipe is totally that for me! I love rice krispie treats too! Wow! These are so cool! I love how you cut them out like scones – such a fun sweet treat ! I don’t think I drink nearly enough Pumpkin Spice Lattes, OR eat enough rice crispy treats. These sound amazing!! What a great idea! That creamy marshmallow layer does it for me. Fabulous! These look so yummy! Especially that white chocolate on top. && Your picture with the coffee in the background=perfection!! These are pretty ingenious, Aimee. Espresso powder? Who woulda thunk? You’ve really gone one step farther this time! Pressure’s on when it comes to Rice Krispie Treats 🙂 Yes, those stolen minutes are the best!! Yay for krispie treats loaded with pumpkin and coffee! These look amazing!!! 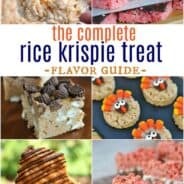 So many great rice krispie treat recipes! Don’t even know where to start. Love how these are oozing with marshmallow! I’m always disappointed with rice krispie treats where the marshmallow is just a shellac — I like serious marshmallow! And great tip on the pumpkin — my only complaint with all pumpkin treats is they get soggy fast. Can’t wait to try it! The recipe sounds great, but not being a coffee fan, do you have any suggestions for a substitute?